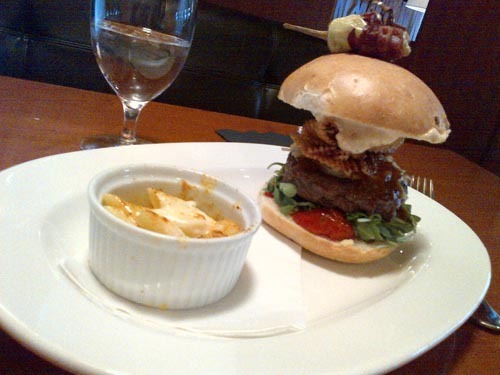 After being seated at the Redwater Rustic Grille, I was pretty quickly advised that the PEI Burger Love burger was the suggested meal for Monday afternoon. "I'll take it", I informed the server. Immediately when the food was delivered I really enjoyed the smell of....not the burger, but surprisingly, the mac & cheese. As good as the burger looked, it was the mac & cheese that really pique my interest when the food arrived. The smell of was creamy & mouth watering. But wait a second, let's take a step back. One main thing that stood out of Redwater is the decor, it's a fabulous looking spot with a high end feel. The bathroom and wifi are shared with the adjoining hotel. The service started out on a good note and finished on one too, although I *almost* felt pressured to purchase an alcoholic beverage. They did a good job keeping my glass full by serving not only my main drink, but water as well. The burgers name? The Butcher's Block. The sweet corn & bacon aioli really stood out for me, adding in the Apple Moonshine BBQ sauce and Cherry Tomato Jam, all I can say is yum. The mix of sauces in my mouth was a watering delight. The flavorful tastes really had me craving the opportunity to come back. Simply put, it was delicious. Out of all the top ranking burgers I have had, this one kept it together till the last bite. 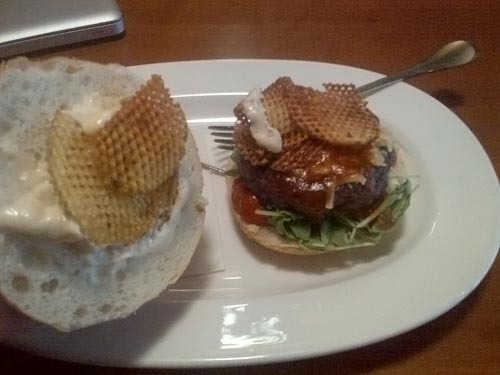 The burger did not mush or break apart like other restaurants. Total cost of the burger, mac & cheese and pop was $19.32 with taxes included. All in all, I did not feel bloated after leaving and nor did I feel the food coma (wanting to fall asleep after a meal). So I was delighted with the experience. Out of a 10 bites, I would give I would give it a 9.